During a period of wet weather, a Committee introduces a temporary Local Rule whereby a player whose ball lies through the green may mark, lift, clean and place their ball within six inches of where it was at rest, not nearer the hole. If a player's ball has come to rest in the rough may they place their ball on the fairway, providing it is within the six inches permitted by the Local Rule? A player has placed their ball at rest on a tuft of grass. As they move away it falls off the raised grass and settles in a depression. May they replace their ball? Yes. There is no distinction in the Rules between fairway and rough, both are covered by the term 'through the green'. No. A player may place their ball only once; it is in play when it has been placed and is at rest. Rule 20-4. The player incurs a penalty stroke under Rule 18-2a if they touch it again. In taking relief under the Rules a player drops their ball at the nearest point of relief in the rough and it rolls onto the fairway, not nearer the hole. Must the player play their ball from the fairway or do they have to re-drop their ball? How far may a ball roll from where it first strikes a part of the course after being dropped under the Rules? If a ball is dropped in the rough and it rolls into a hazard must it be re-dropped? The player must play their ball from the fairway. 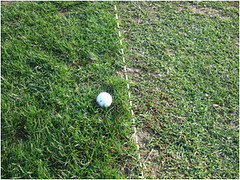 There is no distinction in the Rules between fairway and rough; both are covered by the term 'through the green'. 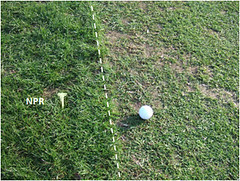 The ball may roll up to two club-lengths, not nearer the hole. Rule 20-2c (iv).